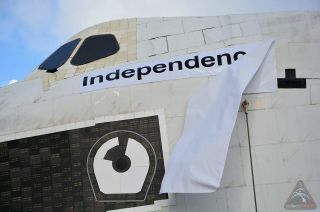 The new name for Space Center Houston's full-size space shuttle replica, Independence, is unveiled, Oct. 5, 2013. Houston's space shuttle mockup is no longer nameless. Concept artwork for the space shuttle Independence attraction at Space Center Houston illustrating the plan for exhibits inside the 747 Shuttle Carrier Aircraft and orbiter mockup.